Lemon Max has always been seen as a highly functional brand, reinforcing the power of lemons in cleaning the dishes. Over the period of time, the brand has incorporated quality, functionality and cost efficiency all in same the offer be it Lemon Max long bar, or the liquid gel. In the current time, the Lemon Max has been introduced with the 30 rupees pack. 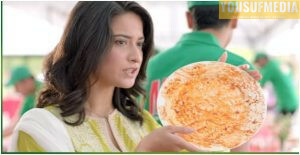 The ad starts with Feisal Qureshi hosting a get-together and presenting the desi dishes of the Pakistani cuisines like mutton korma, karahi and paye which are very hard to wash once dried and also consumes a lot of washing gel while cleaning the dish unto the mark. The ad has been smartly designed showing the whole scenario of big get-together and the traditional food and the concerns of dish washing after the get-together. The ad has beautifully incorporated the functionality of the product. 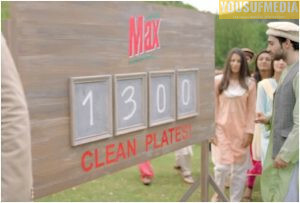 It showed that a value pack of rupees 30 could clean upto 1300 plates with effective cleaning. Now here, giving a quantitative data has proved to be successful as it developed a clear picture, on the customers that how long will the 30 rupees’pouch go. Also, in order to answer the cleanliness concerns, the company efficiently connected logical relation between the product and the customer. Its continuous reinforcement on the use of the power of lemon that cuts stiff marks and oily surface, it again positioned itself logically into the mind of the customer that since lemon is a cleaning agent, Lemon Max gel has a 3times proposition of lemon that cleans the dishes and consumes less quantity hence offer value for money. 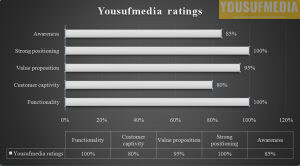 Also, at last, it also showed the pricing of the product that made it clear in the target market about the price and hence developed the conversion strategy effectively. Also in the ad, the company successfully designed the customer journey from awareness to consideration and then to conversion.